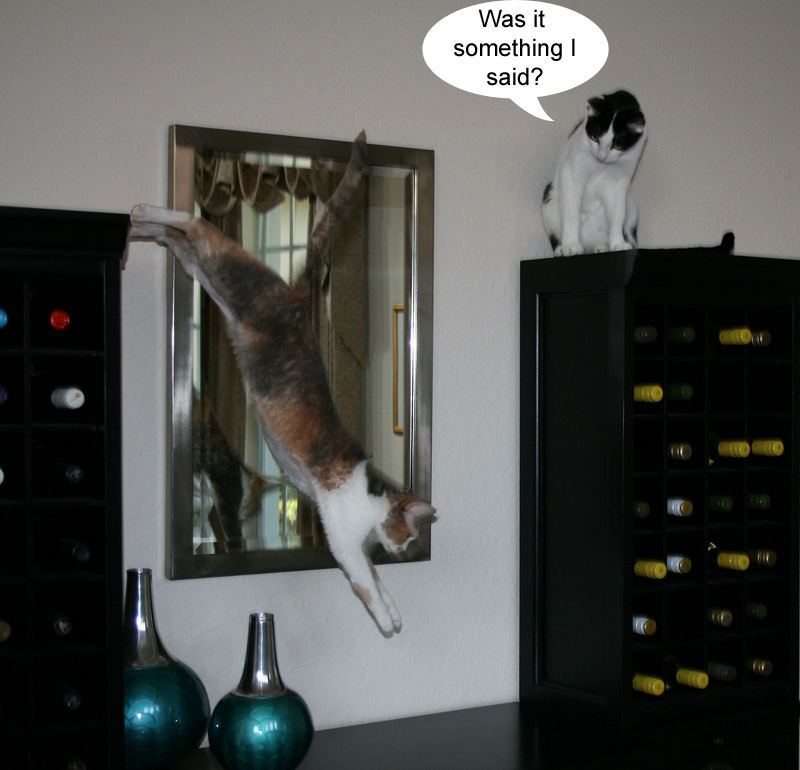 Daisy the Curly Cat: No "Wining"
Look, I can defy gravity! Do I look like Spiderman? 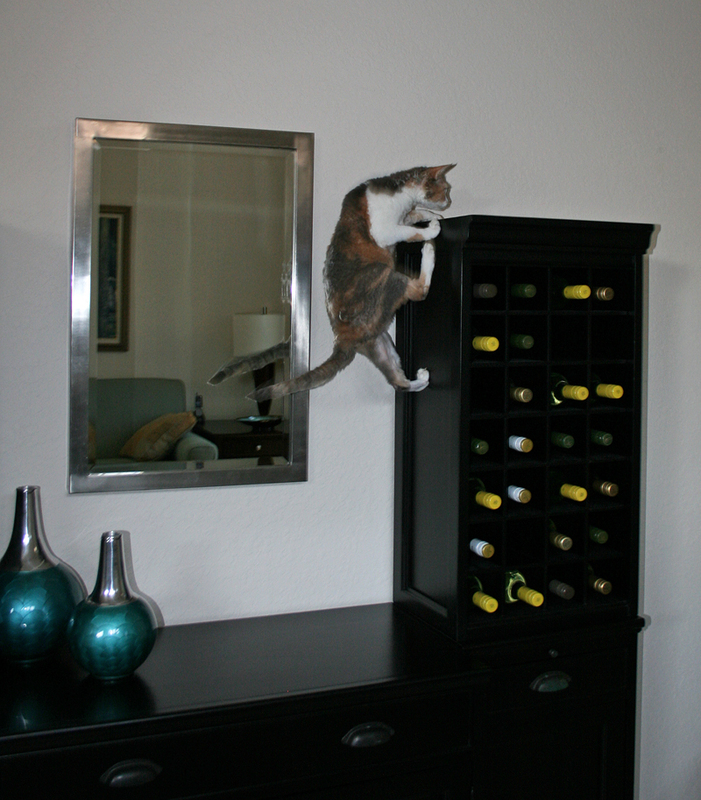 I love jumping and climbing and these wine cabinets are the perfect playground for me. Once I scale one wine mountain, I can leap to the other one. Wheeeeeeee! Harley, stay down there. This is too advanced for you. My Good Time. Ruined again. Harley did not know about the One Kitty Jumping ONLY rule? 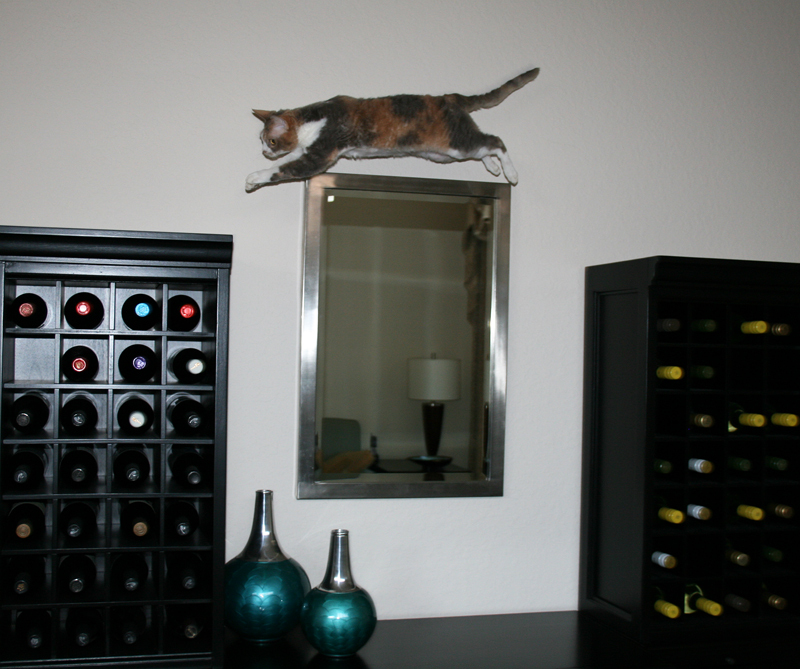 Oh Daisy, you are quite the acrocat. I think it's great that both Daisy and Harley have lots of space to jump and run and play! Aw, gees, can't he get his own ideas? Sheesh. Wow, that is some great picture taking by the Mom. And great jumping Daisy. Too bad that silly Harley had to come along.But you showed him. it's like those cabinets were made for gravity defying leaps. WOW! Daisy you are amazing! Poor Harley - Daisy, he heroine-worships you! That's why he's up there with you. He wants to be just like his sis! Those are the actions of a jungle kitty. Oh, Daisy! I do love my WINEing! Although it never seems to last long enough in my house to put them in a wine rack/cabinet, etc. I'll be making wine this summer with my sisters and that WILL need to go in the wine fridge for aging. We make a pretty yummy cabernet! Do you make teeny tiney clawr marks on the cabinets? 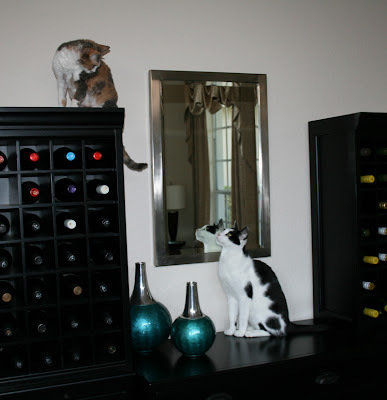 That is great wine storage, Mom! those are some impressive skills Daisy! I like to climb like that, too, Daisy! And the PM says that that's what little bros are primarily for, to wreck good times. I'm glad I don't have one. That looks like a ton of fun! And of course Harley wants in on it as well! hay...share sum vino with harley !! Daisy, you need to get a Spider*girl" suit! YES! The rumors are true...Glogirly is finally home from vacation. My *captivity by Cat Sitter* has officially come to an end. That is until BlogPaws. We are always impressed with your athletic abilities. I just saw Fred Astaire in a clip from "Royal Wedding" movie where it looks like he's dancing upside down and up the walls... I think Daisy has been studying the technique. Wow, Daisy! You really are a spider cat! Too bad Harley ruined it for you. Daisy, that is a great feat! What great photos Daisy you could be a flying trapeze artist. Be careful! Yep! Brothers! Everything yous does, theys gots to do too!